^ Fisher, Richard Virgil; Heiken, Grant; Hulen, Jeffrey Brooke. Volcanoes: Crucibles of Change. Princeton University Press. 1998: 334 [2013-11-12]. ^ Harden, Blaine. Explosive Lessons of 25 Years Ago. The Washington Post. 2005-05-18: A03. ^ List of victims from monument at Johnson Ridge observatory (PDF). KGW news. （原始内容 (PDF)存档于2009-05-25）. ^ As given by What is a Dollar Worth? Calculator. Federal Reserve Bank of Minneapolis. [2013-06-20]. ^ Gorney, Cynthia. The Volcano: Full Theater, Stuck Curtain; Hall Packed for Volcano, But the Curtain Is Stuck. The Washington Post. 1980-03-31. ^ 7.0 7.1 Mount St. Helens Precursory Activity: March 15–21, 1980. United States Geological Survey. 2001. （原始内容存档于2012-10-06）. ^ 8.00 8.01 8.02 8.03 8.04 8.05 8.06 8.07 8.08 8.09 8.10 8.11 8.12 8.13 8.14 8.15 8.16 8.17 8.18 8.19 8.20 8.21 8.22 8.23 8.24 8.25 8.26 8.27 8.28 8.29 8.30 8.31 8.32 8.33 8.34 8.35 8.36 8.37 8.38 8.39 8.40 8.41 8.42 8.43 8.44 8.45 8.46 Harris, Stephen L. Fire Mountains of the West: The Cascade and Mono Lake Volcanoes. Missoula: Mountain Press Publishing Company, Missoula. 1988. ISBN 978-0-87842-220-3. ^ Ray, Dewey. Oregon volcano may be warming up for an eruption. Christian Science Monitor. 1980-03-27 [2013-06-28]. （原始内容存档于2012-06-29）. ^ 10.0 10.1 Mount St. Helens Precursory Activity: March 22–28, 1980. United States Geological Survey. 2001 [2012-10-04]. （原始内容存档于2012-10-05）. ^ Mount St. Helens cabin owners angry at ban. Spokane Daily Chronicle. 1980-05-17. 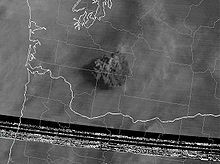 ^ Mount St. Helens Precursory Activity: April 5–11, 1980. United States Geological Survey. 2001 [2011-06-10]. （原始内容存档于2011-06-11）. ^ 15.0 15.1 Reawakening and Initial Activity. United States Geological Survey. 1997 [2013-06-20]. （原始内容存档于2007-06-09）. 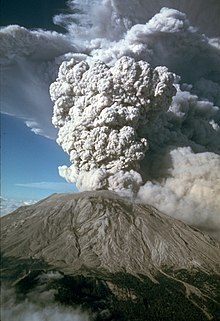 ^ Mount St. Helens Precursory Activity: May 3–9, 1980. United States Geological Survey. 2001 [2010-03-11]. （原始内容存档于2010-03-12）. ^ 17.0 17.1 17.2 Mount St. Helens Precursory Activity: May 10–17, 1980. United States Geological Survey. 2001 [2010-03-11]. （原始内容存档于2010-03-12）. ^ Fisher, Richard Virgil; Heiken, Grant; Hulen, Jeffrey Brooke. 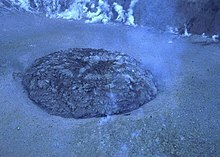 Volcanoes: Crucibles of Change. Princeton University Press. 1997: 117. ISBN 0-691-01213-X. ^ Patty Murray. 25th Anniversary of the Mount St. Helens Eruption. Congressional Record – Senate. U.S. Government Printing Office: S5252. 2005-05-17 [2013-06-28]. ^ Egan, Timothy. Trees Return to St. Helens, But Do They Make a Forest?. The New York Times. 1988-06-26: 1 [2013-06-28]. ^ Michael Lienau. 25To Touch a Volcano: A Filmmaker's Story of Survival. Global Net Productions. [2009-05-19]. （原始内容存档于2011-05-29）. 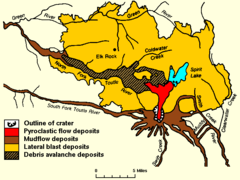 ^ Mount St. Helens – From the 1980 Eruption to 2000, Fact Sheet 036-00. U.S. Geological Survey. [2013-06-28]. （原始内容存档于2013-05-12）. ^ $2.74 billion in 2007 dollars The Federal Reserve Bank of Minneapolis. Minneapolisfed.org. [2008-10-06]. （原始内容存档于2008-10-07）. ^ He Remembers the Year the Mountain Blew (1980). The Oregonian. [2013-06-20]. （原始内容存档于2012-08-29）. ^ Brantley and Myers,. Mount St. Helens – From the 1980 Eruption to 1996 (PDF). USGS Fact Sheet 070–97. 1997 [2013-06-28]. （原始内容 (PDF)存档于2013-06-02）. Klimasauskas, Ed. 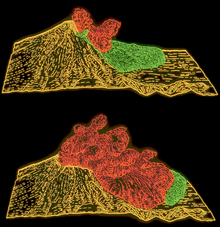 Volcano Hazards Program. United States Geological Survey. 2001-05-01 [2013-06-20]. Topinka, Lyn. Mount St. Helens: A General Slide Set. Cascades Volcano Observatory. U.S. Geological Survey. [2007-12-17]. （原始内容存档于2007-12-18）. Robert I. Tilling; Lyn Topinka; Donald A. Swanson. REPORT: Eruptions of Mount St. Helens: Past, Present, and Future. 1990 [2011-10-25]. （原始内容存档于2011-10-26）.